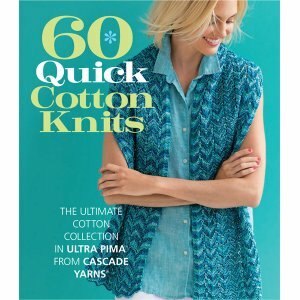 60 Quick Cotton Knits is the ultimate collection of projects created for cotton yarn. Featuring Cascade Yarns' Ultra Pima cotton yarn, these 60 designs are must-haves for the many knitters who prefer to work with cotton, whether they are allergic to wool, opposed to using animal fibers, or just looking for a lighter yarn that keeps cool in warmer climates. A wide range of creative, on trend projects-featuring sweaters, hats, shawls, bags, and more-will appeal to any knitter looking for cool, quick, easy-care knits. Supremely soft with a silky sheen, Cascade's Ultra Pima offers a superior grade of cotton available in a generous amount of colors, giving knitters of every stripe the quality and choice that Cascade is known for. You can also view all 60 Quick Cotton Knits.